What makes Mulate’s Family-Style dining so special? Home/Dinner, News/What makes Mulate’s Family-Style dining so special? It’s a time to relax and enjoy the company of your family, all the while having a party in your mouth. In Louisiana, families are very close-knit and sharing meals as a family is sacred. Family-style dining refers to ordering a variety of dishes, and sharing these dishes so as to have a sample of each specialty on everyone’s plate, as opposed to each person ordering an individual meal. This is popular because it allows everyone to experience the nuances of the various dishes. Ordinarily, the head of the family will order various appetizers to share. The same principle applies but it is a variety of entrées ordered to be shared instead of or in addition to numerous starters to taste. Often times, a variety of desserts are ordered as well. The point is to taste and compare all of the different flavors your taste buds experience during this culinary spectacular. It encourages conversation and laughter… as well as a great experience for the entire family. With the live Cajun music in the background, dancing if you care to engage, there are spirits available to round out the experience. Ask your server for recommendations and daily specials. 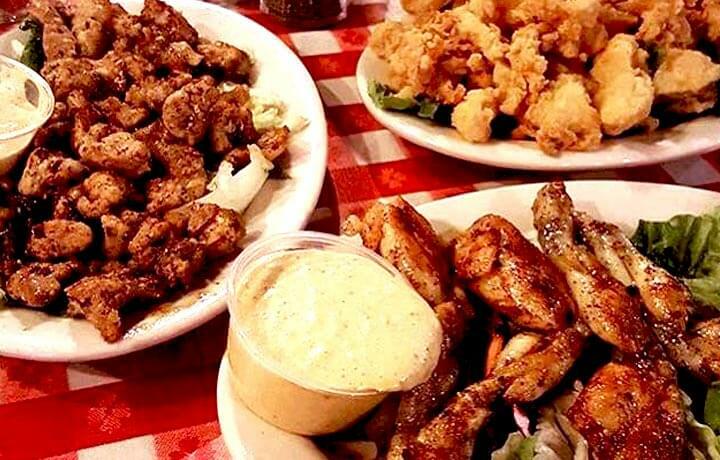 You could start your meal with a cup of Gumbo, or order a Sampler Platter for all to share. Follow with a variety of entrées. Then sweeten up the evening with choices of our Homemade Bread Pudding with Butter Rum Sauce, Atchafalaya Mud Cake, Caramel Cheesecake, Key Lime Pie, Homemade Butter Pecan Pie, Chocolate Chunk Brownie, Homemade Oreo Cream Dirt Cake, and Local berries & cream (seasonal). Watch their faces light up as they sample these sweet treats! Follow up by dancing away the calories just consumed. Learn how to Cajun dance if you do not already know how. Families linger around the dinner table in these parts and never rush through a meal. Join us at Mulate’s, located at 201 Julia Street in the Warehouse District, and laissez les bon temps rouler. For more information, call (504) 522-1492 or contact us by email at chantelle@mulates.com.